Today is a boss's holiday. At the end of the nineteenth century, the American labor movement was among the most militant in the world. From the stockyards of Chicago to the coal mines of Pennsylvania, workplaces all over the country were in open revolt. Strikes were commonplace, often leading to violent confrontations between rebellious workers and private militias like the despised Pinkertons. Tragically, our labor movement was never strong enough to buck the tyranny of capitalism for good. And today, with union membership in dramatic decline and workers under sustained attack from the political establishment, this militant past often feels like a distant, even irretrievable, memory. But American workers did contribute at least one lasting legacy to the international movement for working-class liberation — a workers’ holiday, celebrating the ideal of international solidarity, and eagerly anticipating the day when workers might rise together to take control of their own lives and provide for their own well-being. That holiday is May Day, not Labor Day. Labor Day has conservative roots. In 1894, President Grover Cleveland pushed Congress to establish the holiday as a way to de-escalate class tension following the Pullman Strike, during which as many as ninety workers were gunned down by thousands of US Marshals serving at the pleasure of railway tycoon George Pullman, one of the time’s most hated industrial barons. A few months earlier, the Pullman Palace Car Company — a prominent manufacturer of railway cars — drastically cut wages and laid off a number of workers at their Chicago factory. Four thousand workers — many of whom lived in the company town of Pullman, IL and were further outraged by high rents — went on wildcat strike. In an impressive display of working-class solidarity, more than 150,000 railroad workers in 27 states joined the strike in the weeks that followed, refusing to switch, signal, or service trains pulling Pullman cars. Suddenly, with all trains at a standstill, the railway system was under the control of the American Railroad Union, then led by Eugene V. Debs. President Cleveland conveniently invoked the executive responsibility to deliver mail to claim the strike was illegal and unjustified because the US Postal Service relied on train travel. He mustered a heavily armed force of more than 14,000 US Marshals, soldiers, and mercenaries to break the strike. After days of fighting and more than 30 workers killed, the strikers were dispersed and trains began to move. The Pullman Strike was one of the most catalyzing moments in American history, leading working people all over the country to draw revolutionary conclusions — including Debs, who read Marx for the first time while imprisoned for his role in organizing the strike. Cleveland was wary of the response to his actions. He signed Labor Day into law a mere six days after busting the strike. Convincing American workers to accept such a transparently disingenuous maneuver was a hard sell. But Cleveland found an effective ally in Samuel Gompers, the president of the American Federation of Labor (AFL), a conservative coalition of skilled workers that had opposed the strike. Gompers immediately endorsed the president’s holiday — Cleveland even presented him with the pen used to sign the holiday in law. Gompers later wrote a superlative column in the New York Times praising Labor Day as the harbinger of “a new epoch in the annals of human history.” He made the absurd claim that Labor Day “differs essentially from some of the other holidays of the year in that it glorifies no armed conflicts or battles of man’s prowess over man,” and wrote scathingly about the “dark side of the labor movement” represented by the Pullman strikers. Although previous Septembers had seen small workers celebrations in many states observing the end of summer, the first federally protected Labor Day was marked in 1894 with an AFL-supported parade. Debs still sat in jail with seventy-one others arrested during the Pullman action. Around the same time, the American Railway Union — previously the most powerful union in the country — was forcibly disbanded after the AFL denied its appeal. Labor Day marks our historic defeat, not our triumph. Cleveland’s choice to establish Labor Day in September deflected attention away from another explosive labor action — the Haymarket massacre of 1886, the origin of international observance of the May 1 holiday. 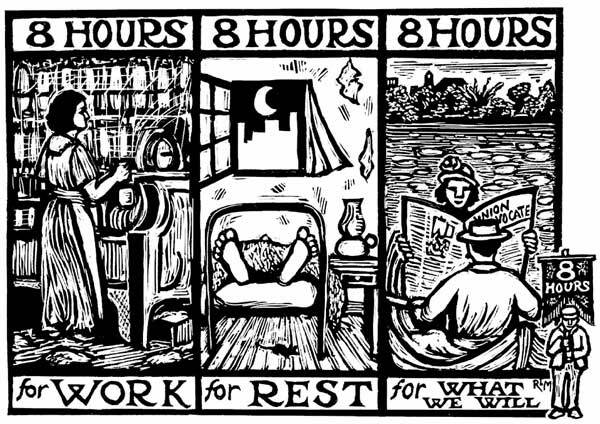 That very different celebration emerged from the struggle for an eight-hour workday, a central demand of the American labor movement. The organizing would ultimately pay off — the right to eight hours of work, eight hours of leisure, and eight hours of sleep was eventually enshrined in law. But it took decades of struggle for American workers to receive even this simple protection. On May 1, 1886, more than 250,000 workers in the Chicago area went on strike in support of the demand, closing 13,000 businesses and flooding the city’s streets with demonstrating workers. Despite their ideological quarrels, anarchist organizations ultimately supported the call to strike made by the Knights of Labor and others, mobilizing thousands and turning May 1 into a formidable show-of-force for the city’s workers. But the demonstration ended in tragedy. After several days — during which the strikers’ ranks swelled and workers confronted police and government agents in the streets — a bomb was thrown into a crowd of police in Chicago’s Haymarket Square on May 4, likely by a provocateur working for one of Chicago’s industrial titans. The police fired into the crowd of workers in retaliation, killing dozens. In the months that followed, police would conduct a witch hunt for anarchist and socialist leaders, many of them recent immigrants. Many of those arrested and executed became household names in Chicago’s working-class districts. For years following the Haymarket massacre, socialists and anarchists came together on May Day to commemorate the sacrifices of the Haymarket martyrs and to make a unified demand for a better world. Each year, the American establishment was reminded of the tremendous power and volatility of the working class. Attempts to undermine May Day didn’t stop with Grover Cleveland. In 1958, President Eisenhower established “Law Day,” designating May 1 as a day to celebrate the rule of law and its role in shaping American life. The holiday remains on the books to this day. May Day celebrates the historic power of the working class to oppose its oppression and fundamentally alter society. Though it’s a welcome break from work for many of us, Labor Day is just another legacy of worker defeat. And today is hardly even a day of rest for millions of the most precarious and underpaid workers in the country. For millions of retail workers in the country, of whom only 5 percent are unionized and the median hourly wage is only $10, Labor Day is one of the toughest times of the year. This year and every year, millions of unprotected retail workers will go to work on Labor Day to earn severely depressed wages. Many will work shifts longer than eight hours. From its origins as a presidential ploy to its current incarnation as a back-to-school shopping bonanza, Labor Day has little to offer American workers except a badly needed beach day. But May Day celebrates the historical hope for a fundamentally different society — a dream that made American workers some of the most fierce antagonists capitalism has ever faced. Jonah Walters is a researcher at Jacobin and a graduate student in geography at Rutgers University. Today is a boss’s holiday.